Last week I had my four kids in the backseat, the lake breeze rolling off the water drifting into our van windows as we listened to music, the beach toys hardly had time to shake the sand from our previous trip just two days before and we were already back for more fun with friends at the beach. When that beach breeze settles over my skin and the sand rushes between my toes, it brings so much peace to my spirit. Our whole Summer was filled with pleasant moments like that and it has taken me years and years to get to this point as Mom. Where I could feel a bit more carefree, loosen up and enjoy the moments with my littles as well as seek additional fun that would have typically been passed over. Too much work. I was too tired. For the last eight years I have either been pregnant or had a baby Every. Single. Summer. I treasure bringing these blessings into the world and as much as possible choose to delight in my littles as their Mom, but it can make doing things quite difficult unless I have back up. One year my husband worked two jobs and was gone 6 days a week as he worked towards business ownership. That Summer there wasn’t a single day we had free as a family to do anyting Summer related. We were both burning the candle at both ends that year. Him at work, and me at home with 3 littles under the age of 4. Summer after Summer I had forgotten what it was like to be able to just take off for an entire morning without needing to stop and catch my breath from my ginormous baby belly or stop to nurse a baby while my little kids found trouble in every corner. It can get downright tedious each and every Summer just waking up and getting through the day with tiny ones. You see everyone else prancing off to the splash pad, beach or out on a nature hike and you are struggling to plan your next trip to the shower. The weather could be amazing outside but you feel a bit trapped and a lot like you are missing out. After the Winter cabin fever that comes alongside being a Stay At Home Mom you look seriously forward to Summer, perhaps only to wonder if it is even much different than the confines of Winter. You may even begin to regret the whole stay at home mom thing just before things get amazingly awesome. I had one entire Summer where I had been 6 months without more than a few straight hours of sleep, because I was unaware I was dealing with a milk intolerant baby. He wouldn’t sleep more than 30 minutes at a time without needing me throughout the night. No amount of anything I tried worked until I finally eliminated dairy from his diet on his first birthday. That Summer was one for survival. I was like the sleepiest version of myself and once I even got a speeding ticket because I was so tired I couldn’t even focus on how fast I was driving. Trying to comprehend bringing my toddler and colicky baby to the beach wasn’t even a question. It wasn’t happening. I have been in those Summer trenches of exhaustion and I know it may feel like it will never end. Gloriously not only will it end, but then you will have a whole troop of kids to hang out with all Summer who just add to it’s fun and exitement. We got to spend two entire weeks, one in June as well as one in July, up north visiting my family on the gorgeous water views of Charlevoix. Multiple trips to the beach where my kids got to dig in sand for hours, enjoy lots of great waves on their boogie boards as well as float all over Lake Michigan. Thanks to my Summer of becoming a more Fun Mom, I swam with my kids every time and they adored having me play in the water with them. Late night campfires with friends staying up way past bedtime, roasting marshmallows and catching fireflies. Because we could all sleep in the next morning. Trips to the store in the morning and errands done before Dad got home so that we could enjoy hanging out as a family at night. Nature hikes that involved stopping to smell the flowers, literally, and we actually had time. During one hike we may have gotten too adventurous as well as lost! After a few extra miles of hiking added, we made it back. Then there is the sleep. Oh sweet wonderful sleep is no longer some elusive daydream but actually transpires each and every night! I slept in until 8:30am nearly every day and was still up and ready before my kids who all slept until 9am. I don’t feel guilty, I have simply enjoyed it. I had the ability to pursue a few things I’ve wanted to try. Starting a blog was a pretty big dream of mine that has been an absolute joy to work on over the Summer. I finally had time to dedicate, my husband was supportive and I am beyond thankful for my many readers who have cared to hear what I have to say. It is humbling and I take the fact that you all read my writing quite seriously! Seeing Soaring Arrows come to fruition has been a true labor of love and sacrifice from my entire family. I also got to go Paddleboarding which I had wanted to try for 3 years and never felt like I could make it work with my small kids. Thanks to my Mom who watched my toddler and my Dad who brought the biggest three of the four littles to the beach to watch me try something new. My sister joined me for the adventure and it was one of the highlights of my Summer. This has been the best Summer of my Motherhood and it is due largely to the fact that I pushed through those difficult years staying at home. And we did get out during those tough years but we were restricted to the confines of naps, our backyard and not far beyond. We would still go up north to visit my parents but I felt like a zombie most years once I got the kiddos packed and drove the van up to see Grandma & Grandpa! Three of my kids are now potty trained, can get themselves in the car on their own as well as buckle in Little Brave. Some of them are big enough to make sandwiches for lunch. I don’t have to mentally keep track of every single one of my four while we are out. A few of them I trust not to dash off running in parking lots. They can brush sand off their own feet and help carry things to and from the beach. A few of them are old enough to play outside during the afternoons with their friends and all they need is 100 glasses of water. No problem because they can get it themselves. I know, some days I am amazed at how much changed in a few short years. They don’t need me for absolutely everything anymore. 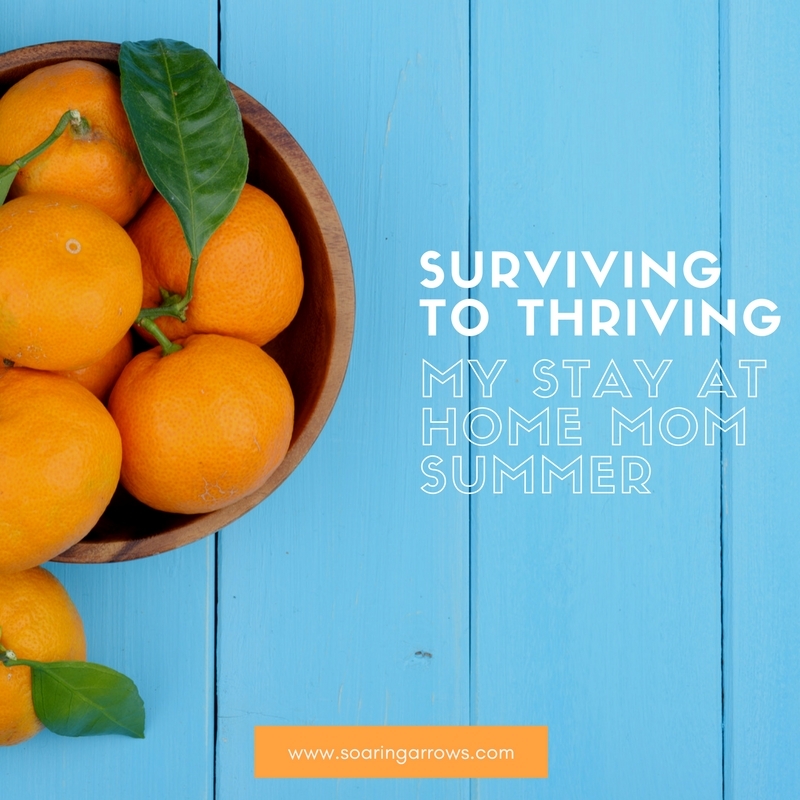 This Summer as I sat enjoying the day, whatever it held as it stretched out before us, I was overcome with gratefulness for this Stay At Home Mom life I have. Some days are still filled with the nitty-gritty, l still have a toddler after all, so it isn’t always kittens and rainbows. Overall this has been the Summer that shows me the light at the end of the tunnel. I am glad I get to enjoy Summer after Summer without the obligation of any job beyond that of my own four children. This week has had me in tears as I anticipate this Summer’s end. I just wish it would extend itself on towards eternity. I usually love back to school as a homeschool mom but this year I just cannot love going back to school. We loved Summer too much. For now l celebrate a Summer well loved. A Summer of fun and slowly savored. Tomorrow we sharpen our pencils and our minds. Together each day is what we’ll always remember.